First and foremost, we're very excited to be announcing our new relationship with K9 Turbo Training ! As of now, they will be offering three 6 week classes, Basic Manners, Puppy Manners & Tricks on site at Happy Hounds. Get your calendars ready! It's time to dust off that old treat pouch and brush up on some extra skills. Your pooch will enjoy the mental stimulation, while you enjoy the bonding time with your favorite furchild. For more info, keep scrolling! It's that time of year again, our third annual Valentine's Day party is quickly approaching. Due to the PAW-pularity of this event, the love fest will now be held on two separate days, Wednesday, February 14th and again on Thursday, February 15th!! Be sure to reserve a spot as they will book up quickly. If your pooch has a standing reservation for daycare on either Wednesdays or Thursdays, you will not need to reserve for the party as your pup is already on the roster. Please do not book daycare for both days of daycare as we'd like to assure enough spots for all the pups wanting to attend. Like the previous years, the puppers will be paired up with one of their favorite friends and dine on gluten-free pasta with a dab of pureed pumpkin while posing for cute pictures. Our parties the last three years were a huge success. We had a blast and were extremely pleased with all the pleasant feedback from parents. If you plan on bringing your pooch to the party, please leave their lunch snack at home. As a reminder, lobby doors are locked between the hours of 10am and 2pm on weekdays. We do not schedule or allow any traffic during those hours. We do lock the lobby promptly at 10am so the pups are able to have free-roam. This is strictly for the benefit of the pack, because by 10am, everyone is ready to start their day of play! Keep in mind, from the hours of 7am-10am, they're segregated between the upstairs and downstairs, with limited access to the yard and rest of the facility. If it's nearing 10am and you're running behind, please call to cancel or reschedule. Due to the PAW-pularity of the Valentine's party, we will be holding two separate days. Please only reserve for one of those optional days as we want to make sure we have room for everyone to attend. 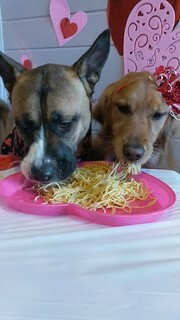 Be sure to reserve your spot for your Lady or Tramp to take part in a special spaghetti date early as spots are limited. That's right, Maddie. It's your time to shine. Work that camera! We're beyond excited to announce a new trainer at Happy Hounds! K9 Turbo Training will be running THREE 6 week classes; Basic Manners, Puppy Manners & Tricks! Thursday, February 22- March 29. In this 6-week course dogs learning tricks such as Spin, Take a Bow, Touch, Wave Hello, stand on small objects! Class is held in Plymouth for dogs that work well around other dogs. Register for Tricks - HERE! Sunday, Feb. 25 -April 1. This 6-week class for dogs 7 months and under. Class helps prepare your puppy for life in our busy and active world and covers everything from socialization and handling to teaching polite puppy manners. Class covers body language, crate training, potty training, biting/nipping, chewing, jumping & more! Behaviors Covered: sit, down, drop it, touch, come when called, basics of loose leash walking & aggression prevent. Register for Puppy Manners - HERE! Sundays, Feb.25-April 1. This 6-week class for dogs 7 months and older. Behaviors Covered include sit, down, leave it, touch, come when called, loose leash walking as well as a few fun, useful tricks! If your dog has issues with aggression or barking/lunging at dogs on leash, please email K9 Turbo Training before registering. Register for Basic Manners - HERE! Laura has a Bachelor of Science in Zoology from Michigan State University and we never see her without at least one book on Canine Ethology and Training in hand. Laura believes strongly in the intersection of training and science and has recently volunteered with the University of Michigan Conceptual Development Lab on a research study into whether dogs form emotional attachments to their toys. Her training focuses on relationship building, effective communication, and the power of play. She has a passion for sharing her knowledge of canine behavior and helping dogs and humans live peacefully together. Abby, a toy poodle, and Piper, a toy fox terrier joined the Happy Hounds family in June 2015. At the time Abby was 3 years old and Piper was 6 years old. Normally we don't do two dogs in one go but let's be real, these two are a packaged deal. With an average weight of 6.5lbs, everything compared to these two is colossal but that doesn't stop them from sneaking out of the office safe zone and taking the long venture to the basement. Athletic and coordinated are two adjectives never used to describe these two, but that doesn't break their spirit. There's nothing that Abby & Piper love more than a good ol' game of fetch. Be prepared for laughs galore as they scramble to catch the ball, only to lose sight as it bounces all around. Piper typically can predict where it's going. Abby... on the other hand, is another story. That girl just spins and hops in circles, frantically trying to track the ball. They put their whole heart and soul into the game but they'll certainly never make varsity. I guess there's a lesson to be learned, the game should be about the love of the sport, not the love of winning. However, after a lost game of fetch, their favorite way to unwind and de-stress is with a supervised shredding party. Let me tell you, we've saved tons of man hours by ditching the paper shredder and putting these ladies to work. First dates are pawkward. Sometimes you meet a perfect gentleman or a lovely lady and sometimes, sometimes you meet someone who isn't afraid to be themselves. All pups attending the party will be offered a small plate of gluten-free pasta with a dab of pureed pumpkin to share with one of their favorite furry friend. With all these scrumptious snacks, please leave lunches at home unless absolutely necessary. Some of the young, rowdy pups may still want to bring a small lunch. visit our Valentine's Album on Flickr! To reserve a spot, Click Here! Monday, February 19th t o enjoy cake with their favorite pooch pals.